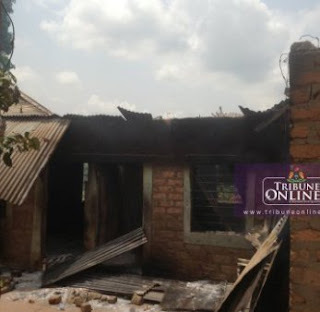 At least 20 houses have been burnt following a clash between Tiv and Jukun at Fiidi, Airport community, in Makurdi Local Government Area of Benue, the News Agency of Nigeria (NAN), reports. NAN gathered on Tuesday that the clash was the result of a prolonged land dispute between the two communities. An eye witness, Mr Steven Angwe, told NAN that the crisis started with a quarrel between two Tiv and Jukun youths at Fiidi Market on Monday. Angwe said the quarrel reopened their dispute over land. He said the crisis, which began at 3p.m. on Monday, persisted till 9a.m. on Tuesday forcing many residents to flee the area. Police Public Relations Officer (PPRO), in Benue, ASP Moses Yamu, told NAN that 20 houses were burnt down while one person was confirmed dead. Yamu said that 17 persons had been arrested in connection with the crisis and that a team of police officers had been deployed to the area to restore peace.